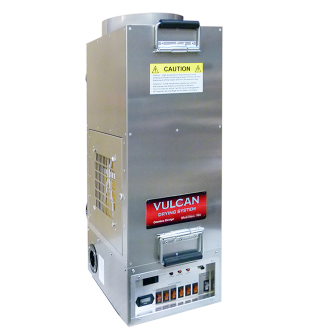 The Vulcan is an electric heat drying system for structural drying that is compact powerful. 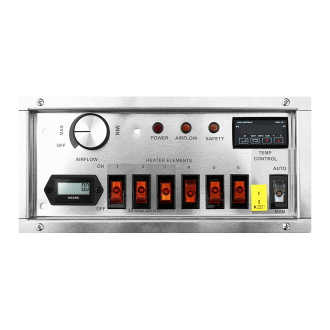 Loaded with 37,000 BTU’s of heat power, the Vulcan offers a wide range of air flow options and precise controls for safely and efficiently. In an industry wide move towards using heat and airflow to increase the evaporation rate of moisture in materials, Omnitec Design Inc. leads the way. The Vulcan is the smallest and yet most powerful electric drying unit on the market today. Our electric heat drying system is a compact and powerful tool for structural drying, sanitizing with heat and space heating. 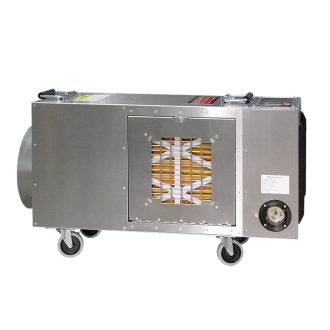 Two versions of the Vulcan are available with 11 KW heaters and integral variable speed blowers, specifically designed to work well with modern LGR dehumidifiers, and other specialty drying equipment. Heater can deliver 180⁰F hot air with a temperature rise of 95⁰F at 350 CFM airflow. It produces 37,000 BTU output with 6 individually controlled heating elements. A high static pressure blower with adjustable airflow from 100 to 475 CFM. Panel mounted programmable temperature controller. Thermocouple probe with 25 ft extension, can measure air or material temperature for efficient and safe heat control. Highly portable with a compact, 30” long, 11” wide, 18” high housing, 63 lbs. weight and 3” locking casters. 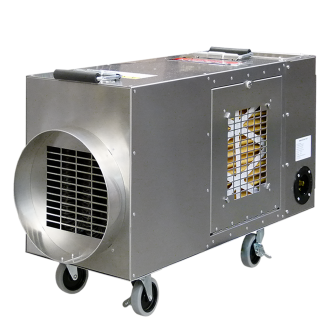 Vulcan heaters are built to perform in tough construction environments and are easy to maintain. This products meets UL, CSA and OSHA safety standards.